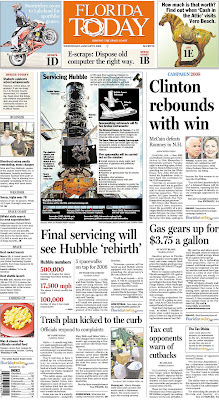 The question du jour: How long before Gannett starts offshoring newsroom jobs? Use this link to e-mail feedback, tips, snarky letters, etc. See Tipsters Anonymous Policy in the sidebar, upper right. Or leave a note in the comments section, below. 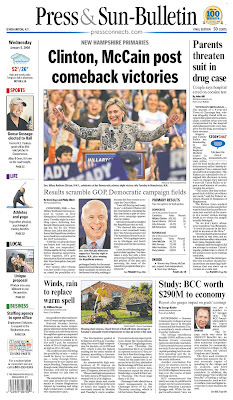 New Hampshire election officials had barely finished counting votes last night when pundits were dubbing senators Hillary Rodham Clinton of New York and John McCain of Arizona the Comeback Kids. 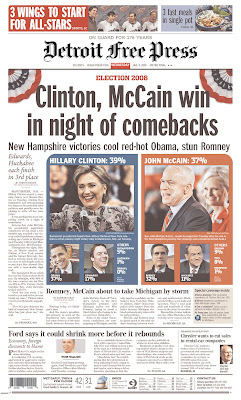 Here’s how some Gannett papers played news of the presidential primary upset on front pages this morning. The Detroit Free Press hung bunting; I’m not so crazy about the blue and red backgrounds surrounding the lede photos . . .
You are currently browsing the archives for the Binghamton category.